The most common type of C. ×willisii kept in aquaria. Typical is the yellow throat which extends a bit on the limb, making the collar very pronounced. photo Boorsma A rather dark limb. Note the structure of the limb. Note also that the twist of the limb has a left turn (corkscrew). This can vary in one specimen. coll. hort., cult. B 668 An even darker colored specimen, with a right turn. Note that the leaves can have some brownish on the veins. photo van Wijngaarden Though C. ×willisii is not always easy to flower, one can have several flowers at the same time. For experiments on crossing an ideal situation. The former C. lucens is regarded now as one of the many hybrids in the C. ×willisii complex. 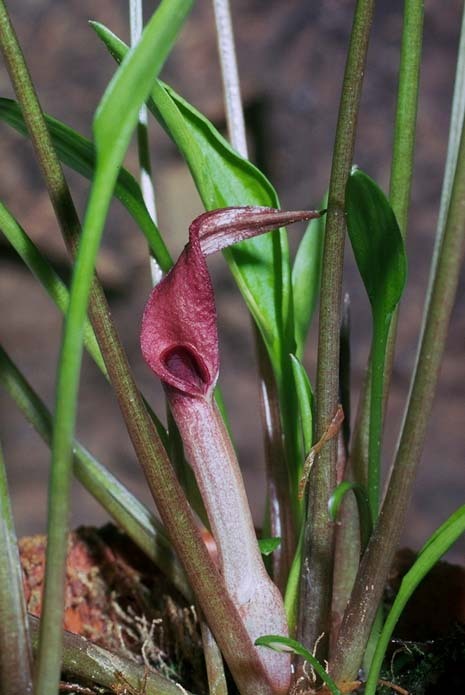 The color of the limb of the spathe may vary to grayish pink. 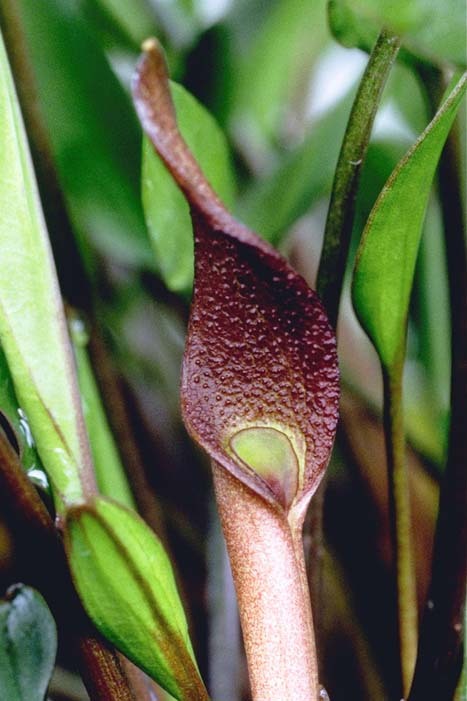 The leaves are mostly more elongated. coll. hort., cult. B 588 A specimen which must be regarded as C. ×willisii. The leaves are quite normal, but the spathe does resemble C. beckettii. Collected near Halloluwa (Sri Lanka). photo Jacobsen The same plant as pictured at left was already in culture for some time and is easy to cultivate. coll. hort., cult. B 639 A very distinct feature of this plant is that there are fine red dots on the limb of the spathe. photo Möhlmann De Wit (1990) gives this drawing of C. ×willisii. drawing Ike Zewald In the same book this drawing of C. lucens. 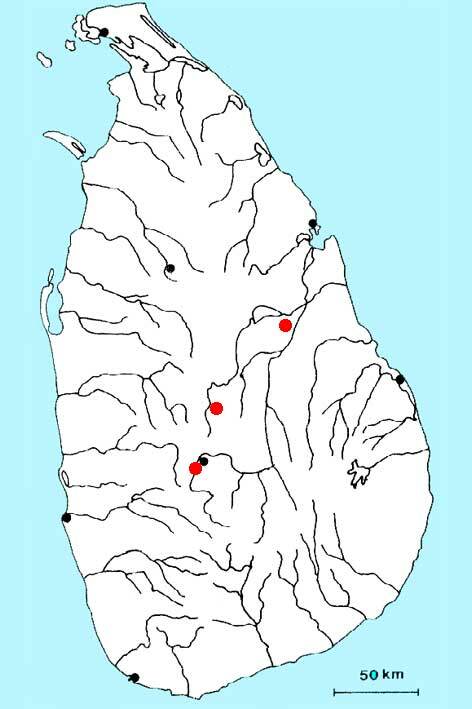 drawing Ike Zewald Distribution of C. ×willisii on Sri Lanka. The most 'dramatic' change in the nomenclature of Cryptocoryne for the aquarist was made in 1976 by Niels Jacobsen when he proposed to change the name of the very popular aquariumplant C. nevillii into C. ×willisii (see the arguments on the C. nevillii page). Up to now there are even nurseries and wholesalers who still use the old name. As things can be complicated, it turned out that the plant is a natural hybrid, so the right name is spelled with a cross: C. ×willisii. The most common type seen in aquaria (in Europe) is the top left specimen with a rather reddish limb and a yellow throat, and above the collar a narrow yellow rim. But they can have an almost black limb of the spathe, see for example Rataj & Horemann (1977). 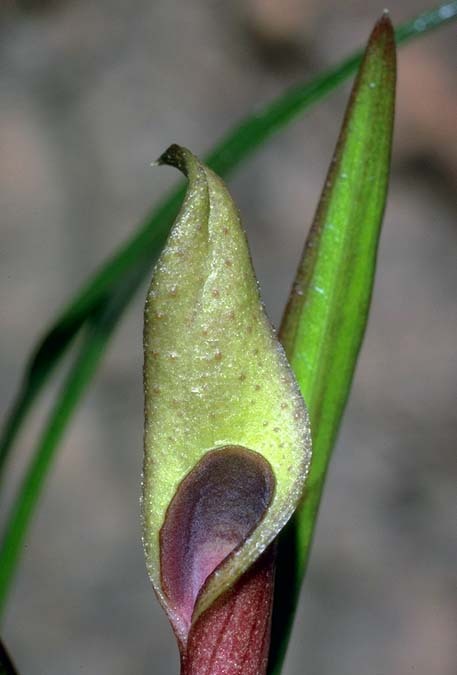 Also C. lucens, described by De Wit (1962) is one of many variations seen in this species. A great surprise to see are plants with leaves like a 'normal' C. willisii but with a spathe like a C. beckettii. This plant too must be regarded as one of the many forms of C. ×willisii, where probably C. parva is one of the parents. This subject is very interesting for hobbyists, one can 'synthesize' his own Crypts or he can try to backcrossing the hybrids, looking for the parents. Niels Jacobsen made a lot of crossings, but many more are wanted. C. ×willisii grows in Sri Lanka in the Kandy area. 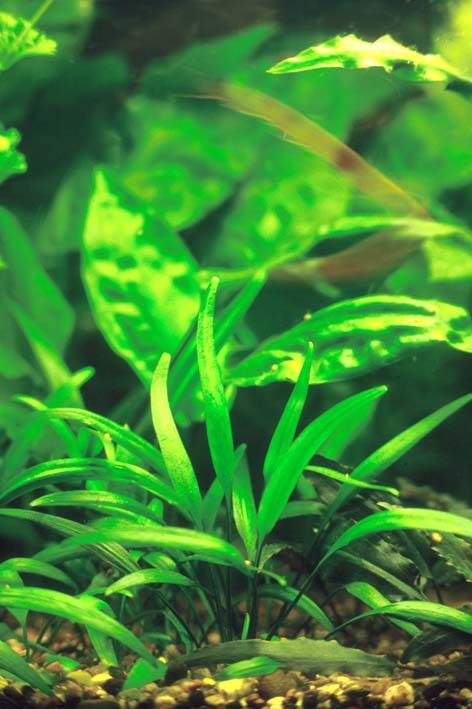 The plants are very easy to cultivate in an aquarium. 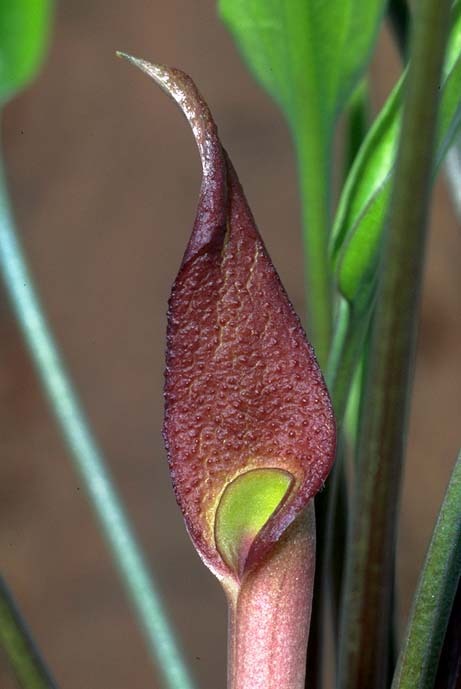 Most forms do not flower as easy as for example C. wendtii do. Alston, A.H.G., 1938. 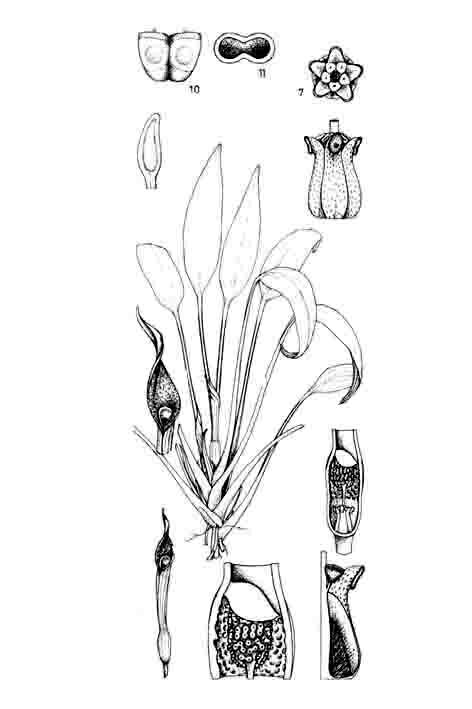 Cryptocoryne in: The Kandy Flora : 68, fig.363-367 (with some drawings). Arends, J.C., Bastmeijer, J.D. & Jacobsen, N., 1982. 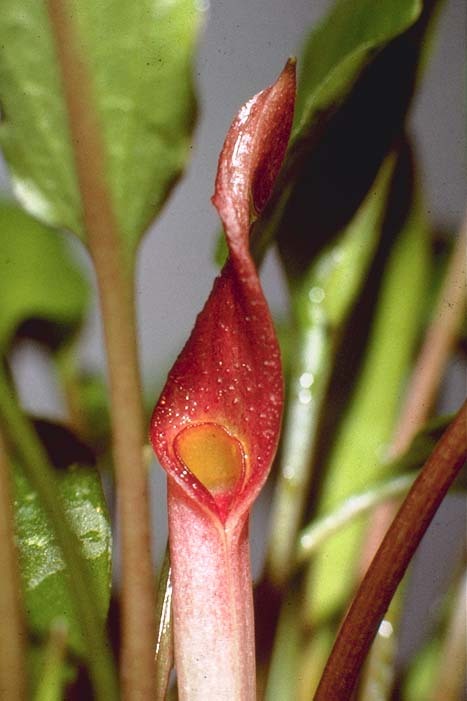 Chromosome numbers and taxonomy in Cryptocoryne (Araceae).II., Nord.J.Bot. 2 : 453-463. Eggers, G., 1994. Sri Lanka 2. Lagenandra- und Cryptocoryne-Arten. Aqua-Planta 1-94 : 20-28. Graaf, A.de & Arends, J.C., 1986. 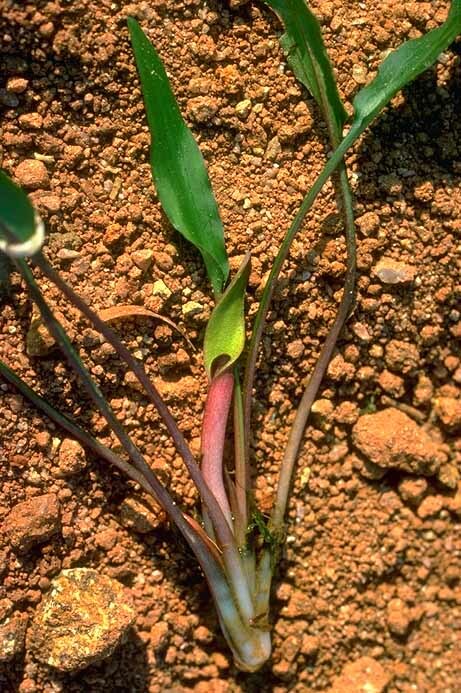 The occurrence of Cryptocoryne and Lagenandra (Araceae) on Sri Lanka. Nord.J.Bot. 6 : 757-764. Horst, K., 1986. Pflanzen im Aquarium. Ulmer, Stuttgart. Jacobsen, N., 1976. Notes on Cryptocoryne of Sri Lanka (Ceylon). Bot.Notiser 129 : 179-190. Jacobsen, N., 1977. 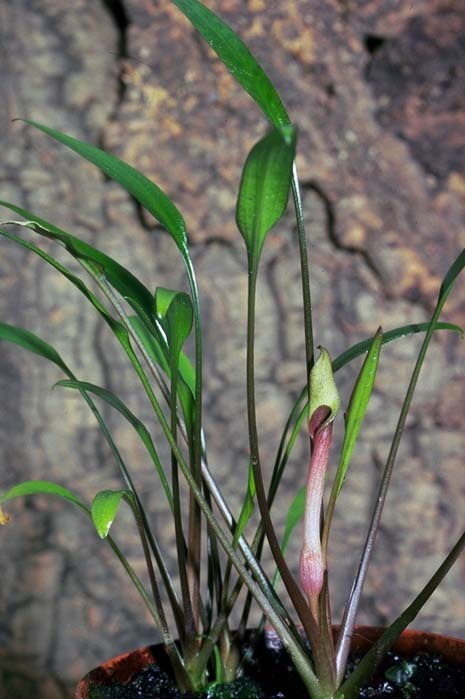 Chromosome numbers and taxonomy in Cryptocoryne (Araceae), Bot.Notiser 130 : 71-87. Jacobsen, N., 1977. Zytologie und Taxonomie der Cryptocorynen Sri Lankas. Aqua-Planta 4-77 : 3-8 (cover). Jacobsen, N., 1981. Cryptocoryne undulata Wendt und Bemerkungen zu andere Arten. Aqua-Planta 2-81 : 31-38 (cover). Jacobsen, N., 1981. Cryptocoryne undulata Wendt und Bemerkungen zu anderen Arten - ein Nachtrag. Aqua-Planta 4-81 : 92-94. Jacobsen, N., 1987. 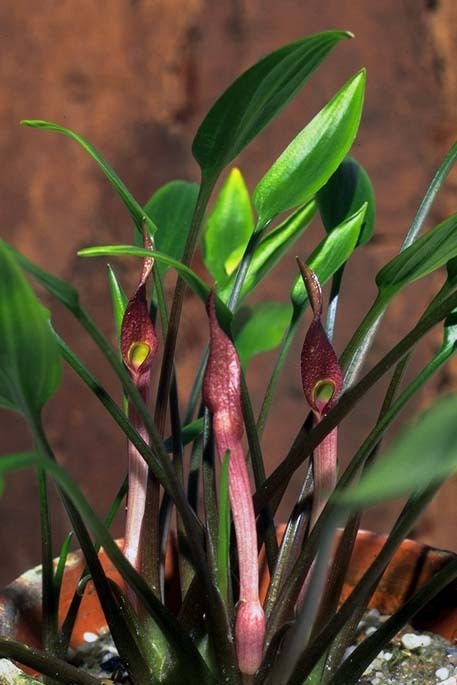 Cryptocoryne in: A Revised Handbook to the Flora of Ceylon, Vol. VI: 85-99. Kasselmann, C., 1995. Aquarienpflanzen. Ulmer, Stuttgart. Möhlmann, F., 1993. Die Cryptocoryne-Arten Ceylons (1). Aqua-Planta 4-93 : 123-128. Möhlmann, F., 1994. Die Cryptocoryne-Arten Ceylons (2). Aqua-Planta 1-94 : 34-39. Petch, B.A., 1928. Notes on Cryptocoryne. Annals R.Bot.Gard., Peradeniya : Vol.11 part 1 : 11-26, pl 2-5 (nice drawings). Rataj, K. & Horeman, T.J., 1977. Aquarium Plants. TFH Publ., USA (good pictures). Trimen, H., 1885. Notes on the Flora of Ceylon. J.Bot. 23 : 269. Wendt, A., 1958. Die Gattung Cryptocoryne Fischer. Die Aquariumpflanzen in Wort und Bild (1952-1958), Stuttgart. Wit, H.C.D.de, 1962. Cryptocoryne lucens in: Nieuwe waterplanten. Meded.Bot tuinen en het Belmonte arboretum WAG Vol VI-4 : 92-98. Wit, H.C.D.de, 1969. Cryptocoryne nevillii Trim. ex Hook.f.. Het Aquarium 39(11) : 242-245. Wit, H.C.D.de, 1990. Aquarienpflanzen, 2. Auflage. Ulmer, Stuttgart.